Ankara's mayor, Melih Gokcek, has stepped down, becoming the sixth mayor to resign as Turkey's Erdogan purges his party's ranks. Erdogan appears to be worried about a string of elections in 2019. Ankara's eccentric mayor, Melih Gokcek, resigned Saturday after 23 years of running the Turkish capital, becoming the latest local politician to bow to pressure from President Recep Tayyip Erdogan as he shakes up his party. The 69-year-old former mayor is one of Turkey's most controversial and high-profile figures, regularly appearing on television and pushing conspiracy theories to his 4 million Twitter followers. He has famously claimed Western powers cause earthquakes to hurt Turkey, called German politician Cem Özdemir an "Armenian servant," and suggested the Obama administration created the "Islamic State." A die-hard Erdogan loyalist, Gokcek announced he would resign last Monday. He made the announcement in his trademark all-caps tweets after a three-hour meeting with Erdogan at the presidential palace. "I leave my post of mayor on orders from our leader Recep Tayyip Erdogan," Gokcek said in a televised speech on Saturday. "I bow to the request of Recep Tayyip Erdogan, not because I do not think I have been successful, not because I think I'm tired... but only because I think (Erdogan) can make our country a leader." In the weeks leading up to the resignation, Gokcek appeared to resist pressure to step down from Erdogan, who said there would be consequences for mayors who didn't resign. Then, the pro-government media that once supported Gokcek started publishing articles suggesting he was close to the opposition Republican People's Party (CHP) and Fethullah Gulen, the US-based cleric Ankara blames for last year's failed coup attempt. Such media reports were clear threats, indicating an indictment could be pending for Gulen ties or corruption if the mayor didn't step down. Similar to Erdogan, Gokcek was close to the Gulen movement before a falling-out between it and the ruling Justice and Development Party (AKP) in 2013. Gokcek is the sixth mayor from Erdogan's ruling Justice and Development Party (AKP) to resign under pressure in recent weeks, including those of Istanbul and Turkey's fourth-largest city of Bursa. Under a state of emergency, Erdogan has also replaced more than 80 Kurdish mayors in the southeast with loyalists over the past year. "Fifty per cent of the population is not governed by the mayor they elected," opposition CHP leader Kemal Kilicdaroglu said Saturday. "You either remove them with a decree or you threaten them,"
More than 50,000 people have been arrested and some 150,000 dismissed from their jobs in an ongoing cull in the wake of the failed coup attempt. Erdogan says the AKP has suffered from "fatigue" and needs new blood as the party heads toward municipal elections in March 2019, followed by elections for parliament and president later that year. The president appears to be worried. A controversial referendum in April to expand presidential powers narrowly passed with 51 percent support. The opposition claimed the lead-up to the vote was unfair and the referendum itself possibly rigged. Crucially for Erdogan, the referendum failed to win a majority in Ankara and Istanbul. A battle between the cross and the half moon? President Recep Tayyip Erdogan has repeatedly accused Dutch and German politicians of acting like "Nazis" and claiming the "spirit of fascism" is rampant in Europe. He later invoked medieval religious wars in the context of escalating tensions between the EU and Turkey. "My dear brothers, a battle has started between the cross and the half moon. There can be no other explanation," Erdogan said. Turkish Foreign Minister Mevlut Cavusoglu, meanwhile, was not to be outdown by his boss. Speaking on Thursday, Cavusoglu said Europe was losing its unity. "Religious wars will soon begin in Europe... If things continue as they are, then it will be so." "You will learn how to behave towards us. If you do not learn, we will teach you." German Chancellor Angela Merkel welcomed the election victory for the center-right prime minister Mark Rutte in divisive Dutch elections. "I was very happy that a high turnout led to a very pro-European result, a clear signal," she said. "I don't intend to participate in this race to trade provocations." Referring to Erdogan's attacks, she added: "The insults need to stop." Meanwhile, Germany's Interior Minister Thomas de Maiziere said Ankara was playing the victim with its attacks on its NATO allies to galvanize support ahead of its referendum in April. Turkish politicians had "no business" campaigning in Germany, he said. 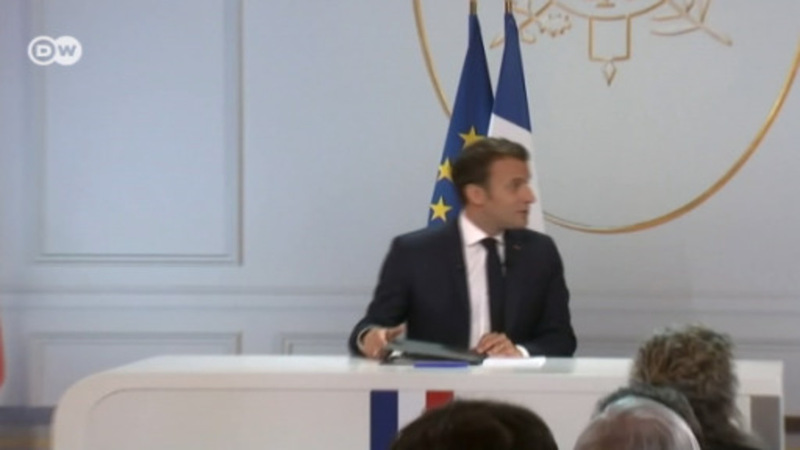 France and Germany plan to establish a European center to counter extremist propaganda and deradicalize young people, he also revealed this week. After a week of heightened tensions between Turkey and the Netherlands, Dutch Prime Minister Mark Rutte emerged victorious in a bruising battle with Geert Wilders. The populist's invective against all things Muslim and anything from the EU failed to earn him the breakthrough that many had come to count on as a given. French President Francois Hollande congratulated Rutte for his election success and his "victory against extremism." He said that "the values of openness, respect for others, and a faith in Europe's future are the only true response to the nationalist impulses and isolationism that are shaking the world." In a joint statement with Angela Merkel, he denounced Erdogan's remarks as "unacceptable." After boosts in Britain and the United States over the past year and Wednesday's setback in the Netherlands, populism now heads to France for its next test of political viability. Now it is for Marine Le Pen of the National Front to carry the torch in presidential elections starting next month. Right message, wrong ring tone? Meanwhile, Germany's far-right kept on message. "I can not hide the fact that we wanted Wilders to have had a better result," the leader of the populist Alternative for Germany (AfD) Frauke Petry said. "Wilders addressed the right issues in the election campaign, but he might not always have had the right tone. Citizens want a clear message, but they are afraid of a hard tone," Petry said. Konstantin Kosachev, chair of the Foreign Affairs Committee in the Russian parliament, wrote that Europe had been "weakened" by the elections in the Netherlands. "French Presidential candidate Emmanuel Macron and Merkel may breathe for the time being after the victory of Rutte, but the fear among the established European elites facing the challenges of the 21st century remains palpable," he wrote.